There is nothing nicer than sitting and chatting with one of your best girlfriends, eating delicious Lebanese food and sipping yummy cocktails. That’s exactly what my friend Ush (check out her brand-new fitness blog here!) 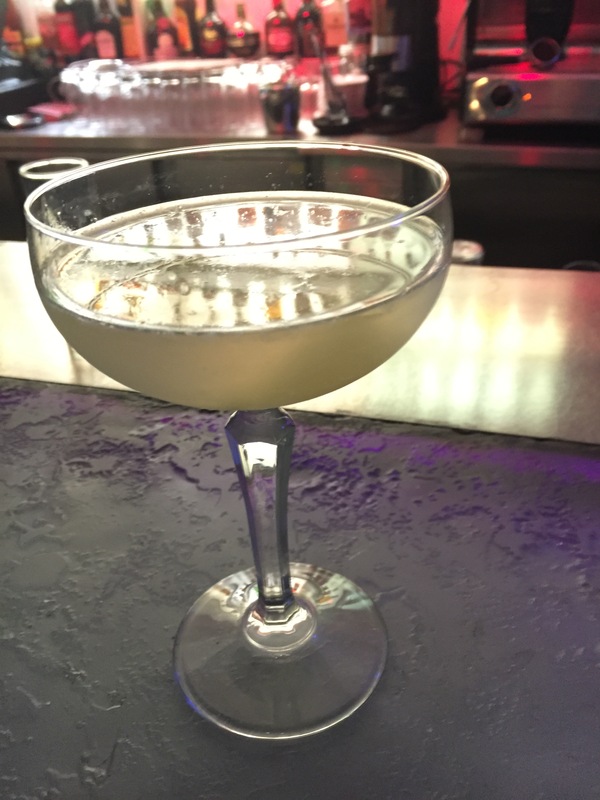 and I did a couple of weeks ago when we visited the newly re-branded Eaton Square Bar & Restaurant (part of the Noura chain), based in up-market Belgravia. It was a busy Thursday night and we had arrived about 45 minutes earlier than our table reservation so sat down by the bar and had a couple of cocktails. I started with a yummy Lychee and Mango martini and Ush had a bespoke cocktail which contained Cassis, Champagne and Chambord. Both were a great start to the evening! The bartenders were really friendly and when we were asking what certain spirits tasted like gave us little samples to try. We got to try Saffron Gin and Chopin Potato Vodka. Eaton Square is a family run restaurant which serves Lebanese cuisine inspired by their dad’s cooking and we opted for a selection of Mezze and then shared a main and dessert. We also opted for a glass of Malbec to accompany our meal. 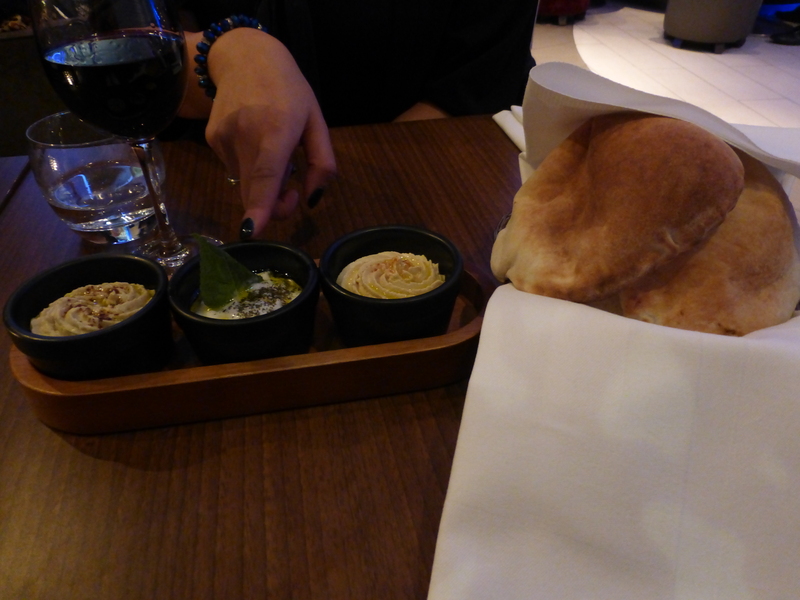 We started with baba ghanoush and a trio of dips with homemade pita breads. What was really unique about this dish the waiter told us is that the aubergine are not mass cooked and every single aubergine is skinned and chargrilled with tender loving care. They employ a guy to just do that all day! Let’s say it pays off as it tasted delicious! The dips were homemade and refreshing. 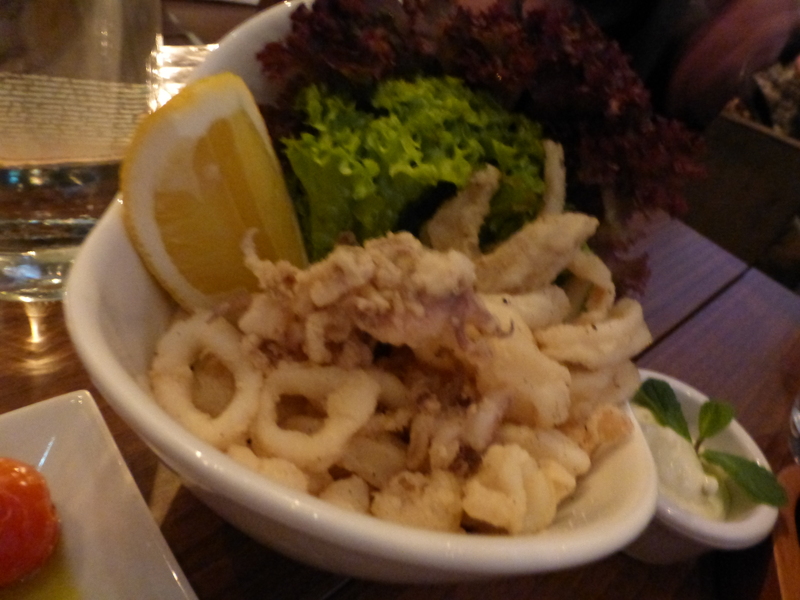 We then moved on to the crispy squid which was cooked with simple flavours, light and soft on the inside and crispy on the outside. It was really tasty and moreish, and served with a tartar sauce. Moving onto the standout dish of the evening and something really special! Now, if you know me you will know that I’m not the biggest lamb or pork fan but the Lamb Kofta’s were something! 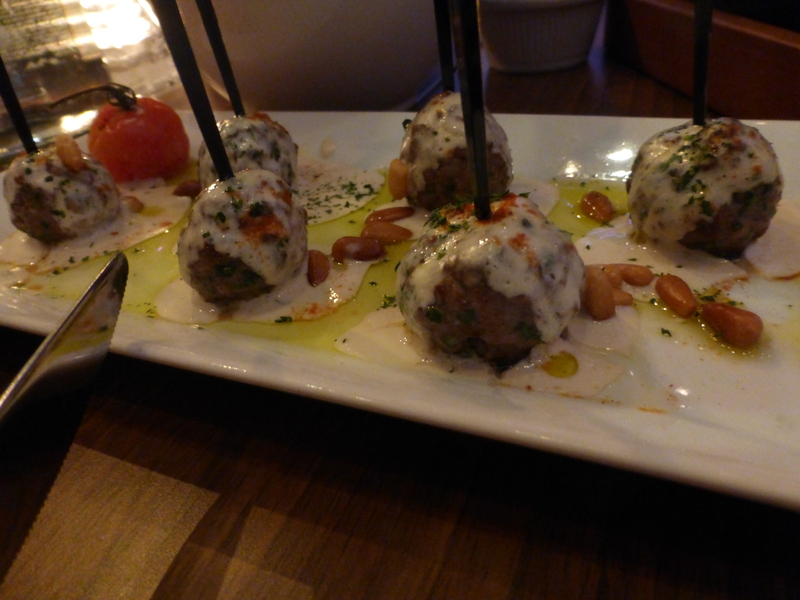 The small kofta’s were served on a plate with sauces, the lamb was soft and tender. They were flavoursome and had a spicy kick. In Ush’s words ‘I have never tasted these intense flavours together, they’re combined really well.’ We were told by the waiter that the lamb had been marinated for 48 hours. 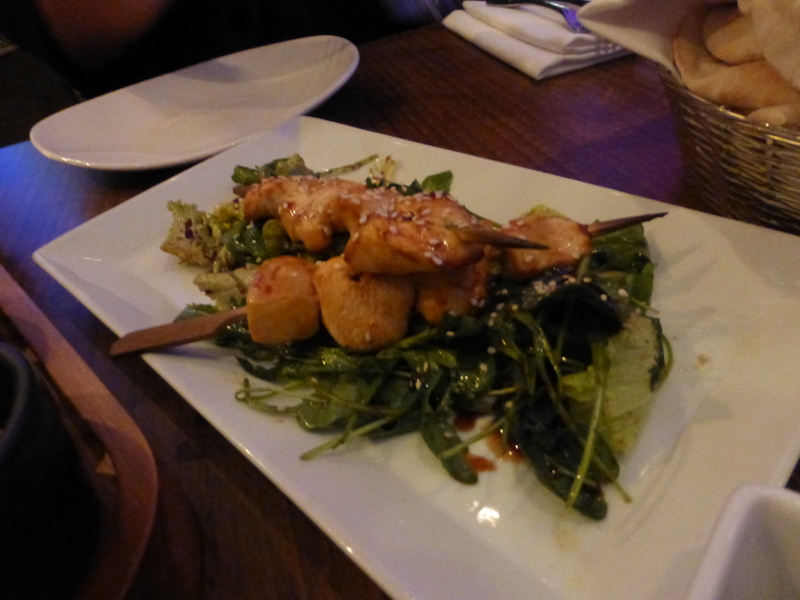 The chicken skewers were served with a balsamic glaze with salad and sesame seeds. They were home-style simply grilled and satisfying. The lamb sausages were made tandoori shish kebab style, like a mixed grill, served with lemon and peppers. These were small but had a spicy kick! I was pretty stuffed by that point but one of my friends’ favourite dishes is lamb shank and it came highly recommended. And Ush is glad she did try it! 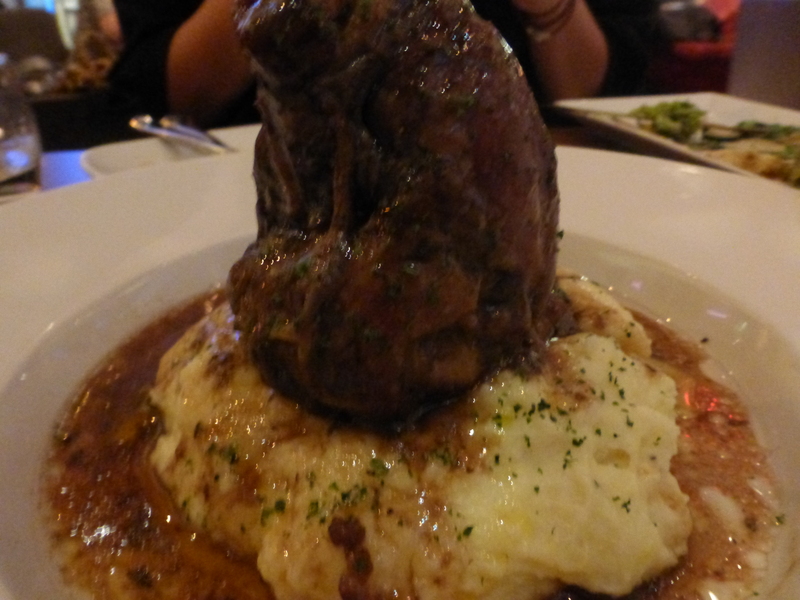 The lamb was tender, succulent, and peppery and served with a creamy, buttery mash and gravy. It was a large portion size, simple but tasty and nicely presented. 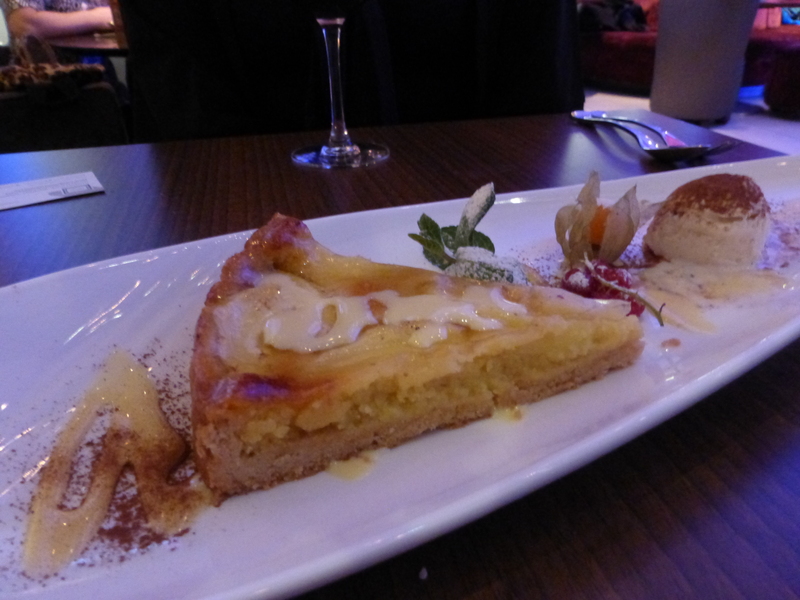 To end the meal we chose the Apple Tart to share. It warm, comforting, nutty, almondy and served with sweet fruit. The perfect end to a meal with your friend. Overall, Eaton Square is a lovely place for after work food or even a nice date. It can get busy so make sure you book a table, they also have live music on so that is a really nice complement to the chilled ambience. A great evening out all in all!